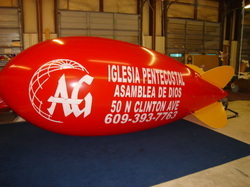 Promotional blimps are easy to use and very effective. A 17ft. blimp like the one shown on the left is $1320.00. That price includes most artwork or lettering on two sides of the blimp. We have many standard colors available and can match most custom colors for an additional charge. Blimps come with 120 ft. tether line, repair patches and instructions.